It was brought to my attention by one of my wonderful pattern testers that there is a little detail in the crocodile stitch that if done incorrectly can ruin the look of the piece. The crocodile stitch is basically a two row repeating stitch where the 2nd row is worked in front of the 1st row (instead of above). The 1st row is a simple v-stitch row. The 2nd row is the "scale" row. 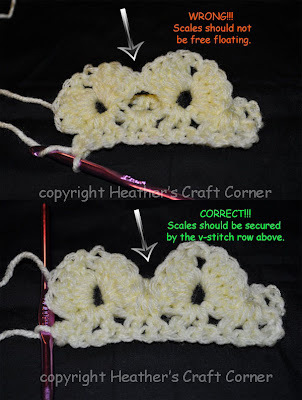 When working the 3rd row (2nd v-stitch row), the v-stitches that land between scales should catch the scale to secure it in place.